The greatest and finest sanctuary of ancient Athens, dedicated primarily to its patron, the goddess Athena, dominates the centre of the modern city from the rocky crag known as the Acropolis. The most celebrated myths of ancient Athens, its greatest religious festivals, earliest cults and several decisive events in the city's history are all connected to this sacred precinct. 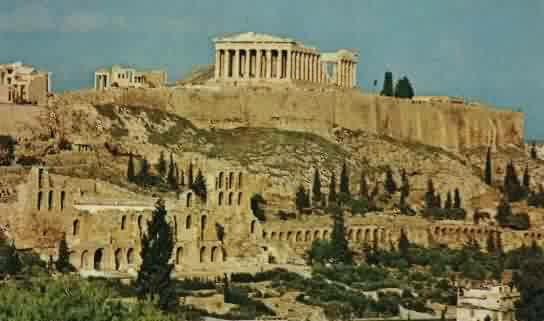 The monuments of the Acropolis stand in harmony with their natural setting. These unique masterpieces of ancient architecture combine different orders and styles of Classical art in a most innovative manner and have influenced art and culture for many centuries. 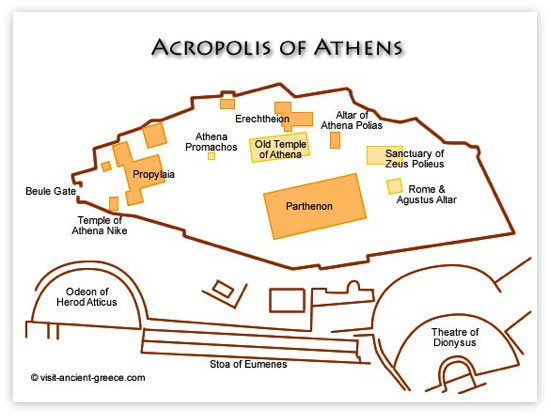 An 'acropolis' is any citadel or complex built on a high hill. The name derives from the Greek Akro, high or extreme/extremity or edge, and Polis, city, translated as 'High City', 'City on the Edge' or 'City in the Air', the most famous being the Acropolis of Athens, Greece, built in the 5th century BCE. Though the word is Greek in origin, it has come to designate any such structure built on a high elevation anywhere in the world. The Castle Rock in Edinburgh, Scotland, for example, upon which looms the famous castle, was fortified as early as 850 BCE and would be known as an acropolis, as would be those cities of the Maya Civilization which fit that definition, even if they were not built on a natural elevation. Although there were other city-states in ancient Greece boasting an impressive acropolis (such as Thebes, Corinth and, most notably, at Kolona on the Island of Aegina), and the designation 'acropolis' was also used in Ancient Rome for a series of buildings set on a higher elevation than the surrounding geography, in modern times the word 'acropolis’ is synonymous with the ancient site at Athens. The Acropolis of Athens was planned, and construction begun, under the guidance of the great general and statesman Pericles of Athens. Over two years of detailed planning went into the specifications and contracting the labour for the Parthenon alone, and the first stone was laid on 28 July 447 BCE, during the Panathenaic festival. Wishing to create a lasting monument which would both honour the goddess Athena (who presided over Athens) and proclaim the glory of the city to the world, Pericles spared no expense in the construction of the Acropolis and, especially, the Parthenon, hiring the skilled architects Callicrates, Mnesikles, and Iktinos and the sculptor Phidias (recognized as the finest sculptor in the ancient world who created the statue of Zeus at Olympia, one of The Seven Wonders of the Ancient World) to work on the project. According to the historian Pedley, "the work…was carried out under the supervision of Phidias. In fact, Plutarch says that Phidias was in charge of the whole of Pericles’ scheme" (251). Hundreds of artisans, metal workers, craftspeople, painters, woodcarvers, and literally thousands of unskilled labourers worked on the Acropolis. Phidias created a gold and ivory statue of Athena which stood either in the Parthenon, known as the Temple of Athena Parthenos ('Athena the Virgin’ in Greek), or in the centre of the Acropolis near the smaller temple of Athena. During the Panathenaic festival, celebrants would carry a new robe to the ancient wooden cult statue of Athena, housed in the Erechtheion. "The Parthenon: Religion, Art, and Politics"